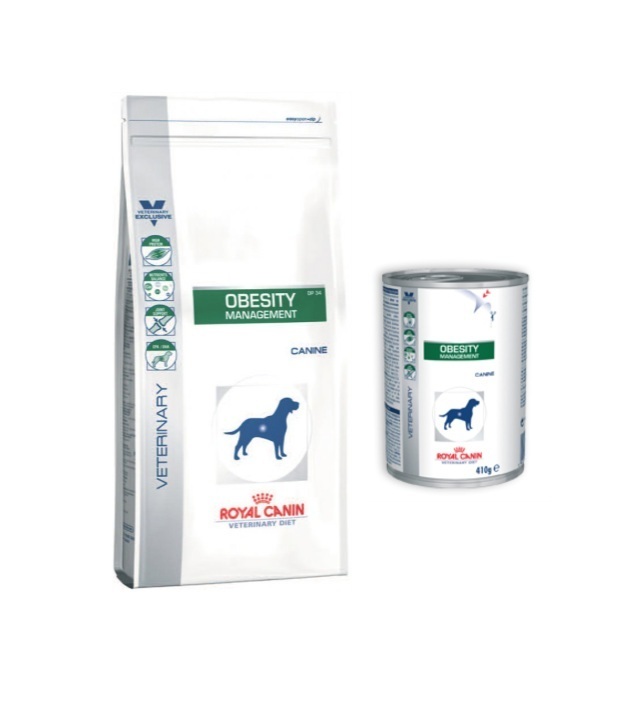 Royal Canin Obesity Management is a nutritionally balanced, reduced calorie diet for dogs with a tendency to gain weight or with weight management issues. The food is fortified with advanced vitamins and minerals to compensate for the energy restriction, as well as omega fatty acids 3 and 6 and trace elements to promote the condition of skin and coat. Obesity Management contains high protein levels to reduce the loss of muscle mass by 30% and whilst being low in fat, does not compromise on quality, texture or taste. With chondroitin sulphate to support joints and tissues and glucosamine to aid mobility, helping your dog lead a more active lifestyle. OBESITY MANAGEMENT is a complete dietetic feed for dogs formulated to reduce excessive body weight. This feed has a low energy density. Bone & Joint Health - Helps maintain healthy bones and joints. Essential Fatty Acids - An optimal level of fatty acids for a healthy skin and a shiny coat. Composition - Dehydrated poultry meat, wheat, vegetable fibres, maize gluten, beet pulp, wheat gluten*, hydrolysed animal proteins, animal fats, minerals, psyllium husks and seeds, fish oil, hydrolysed crustaceans (source of glucosamine), marigold extract (source of lutein), hydrolysed cartilage (source of chondroitin). Additives (per kg) - Nutritional additives: Vitamin A: 15000 IU, Vitamin D3: 800 IU, E1 (Iron): 33 mg, E2 (Iodine): 3 mg, E4 (Copper): 4 mg, E5 (Manganese): 42 mg, E6 (Zinc): 140 mg - Technological additives: Pentasodium triphosphate: 3.5 g - Preservatives - Antioxidants. Analytical constituents - Protein: 34% - Fat content: 10% - Crude ash: 7.9% - Crude fibres: 7.8% - EPA/DHA: 0.14% - Metabolisable energy: 3118 kcal/kg (NRC85). *L.I.P. : protein selected for its very high assimilation. Target weight should be determined according to body condition and breed of the individual. Recommended rations account for the level of weight excess and should be restricted further after 4 weeks where necessary to achieve 1-3% bodyweight loss per week. It is recommended that a veterinarian’s opinion be sought before use. Feed Obesity Management until the target body weight is achieved. Energy Dilution - Decreases the energy intake 50-70% compared to the same volume of a standard wet food. Composition - Meat and animal derivatives, cereals, eggs and egg derivatives, minerals, oils and fats, derivatives of vegetable origin, molluscs and crustaceans. Additives (per kg) - Nutritional additives: Vitamin D3: 95 IU, E1 (Iron): 7 mg, E5 (Manganese): 2.2 mg, E6 (Zinc): 22 mg - Technological additives: Cassia gum: 4 g.
Analytical constituents - Protein: 7% - Fat content: 2% - Crude ash: 1.5% - Crude fibres: 1% - Moisture: 86% - Metabolisable energy: 502 kcal/kg. There are currently no questions for Royal Canin Veterinary Diets Obesity Management Dog Food - be the first to ask one!